Added filter capacitors to wind vane signals. This improves accuracy and reduces false triggers. Software function to detect missing pulses from the wind vane. Helps identify problems with the wind vane operation. Improved filtering and averaging of speed and direction. The wind board is designed to read signals from a Peet Bros wind vane and output a serial data stream. 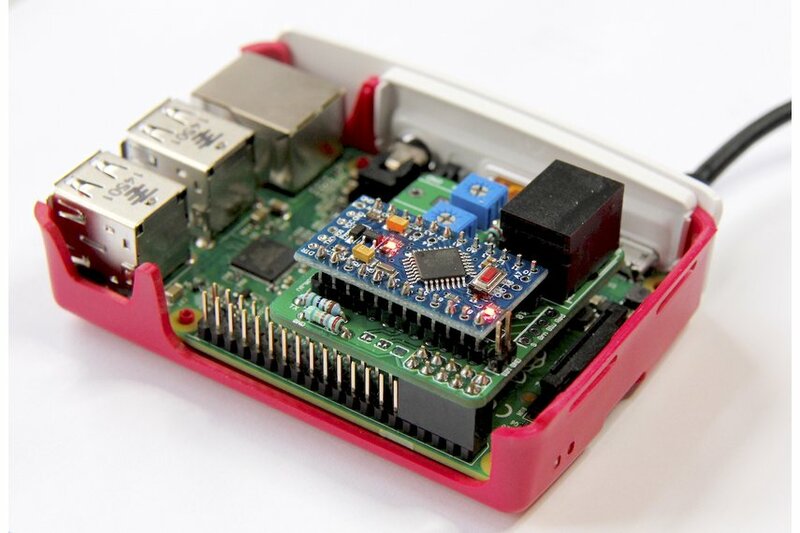 It can be used standalone, through a FTDI USB cable or plugged directly to a Raspberry Pi. The schematic is here and there is more info available on my initial blog post here. There are files here for a small enclosure that can be 3D printed for the standalone board. If you are find that the direction output is not particularly stable and jumps around, you can try doing the mod in Section 8 of this manual. Solder on the right angle header to the Arduino (included with the board). Connect the GND and VIN terminals to a 5 to 10 V power supply. Do not connect more than 10V to the VIN terminal, as the on-board regulator may not last long. For higher voltages use a small dc-dc converter module (Hint: search ebay). 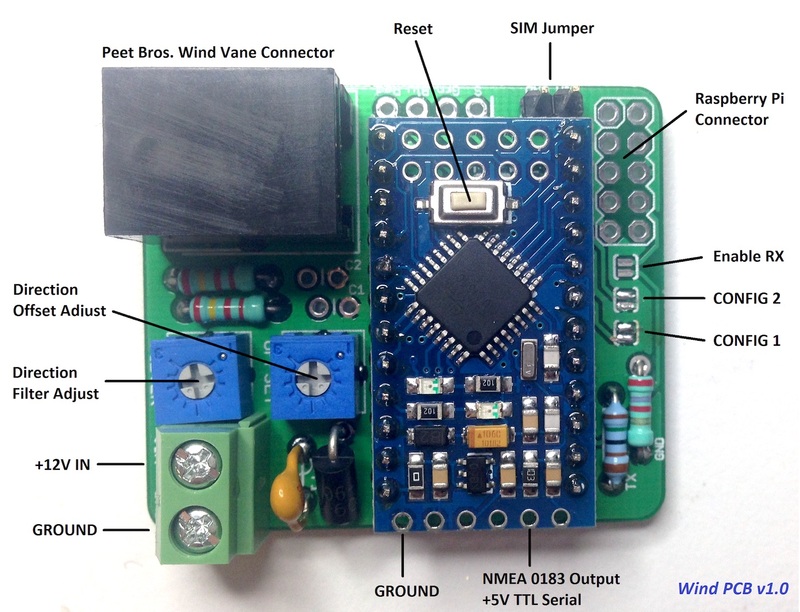 Alternatively run the board on 5V from a USB car charger. Solder wires to the Serial Output and Ground pins of the Arduino as shown in the board layout picture. This will provide a 5V serial output. The receiving device must be compatible with this voltage level. Run through the procedure in the Initial Test section. Connect the board to the Raspberry Pi on the first 5×2 pins of the GPIO header as shown. Another picture here. The board has three solder jumpers and one link jumper. See the picture of board layout for positions and names of these jumpers. Config 1 – Soldering this jumper will change the wind speed output to km/h. Unsoldered the output is in knots. Config 2 – Soldering this jumper will change the serial baud rate to 57600. Unsoldered the baud rate is 4800 to match NMEA 0183 standard. Enable RX – If soldered, this connects the Raspberry Pi TX pin to the Arduino. Not required unless you wish to write custom software. SIM – Simulate jumper. If this is set during a reset, the board will continuously output the direction filter and offset via serial. This allows adjustment of these trimpot values (see Initial Test and Adjustments). If this jumper is set after the board has started, the board will output simulated data for testing. Connect the wind vane, place the SIM jumper, connect a serial terminal and power up the board. With the SIM jumper in place the serial output will show the current filter time, direction offset and a count of missing direction signal pulses from the wind vane.